In the Option Desk, the bid and ask cells are now highlighted if the best bid/ask price is higher/lower than the theoretical price. In the new version, you can add contracts to the market maker by dragging a position or a strategy into the market maker setting form. You can read more about these and other changes in this article. O – out of the money. We’ve added the Risks tab in the Position manager. Now the tab displays only one parameter – the total number of underlying contracts to be settled if options in the money are expired right now. In the future, we plan to add several strategy parameters: maximum possible profit and loss, probabilities of profit or loss, and other useful parameters. Prior to this update, when copying a strategy, positions were copied as fills. For each position in the initial strategy, a position was created in the new strategy. Under each position, there was only one fill. The fill price was equal to the initial position opening price, and the fill size was equal to the initial position size. At the same time, the fills that formed the initial position were not copied. In the Position manager, a duplicate of the strategy will be created. Each fill (excluding the adjustment fills) will be copied to a new strategy. For the copied fills, the Manual type will be set. The Exchange ID will be replaced. In the new version, you can bind the strategy charts form and the active strategy. Click the Bind button. Now, when switching between strategies in the Position Manager, the charts will be automatically redrawn. The price range and zoom are saved separately for each strategy. 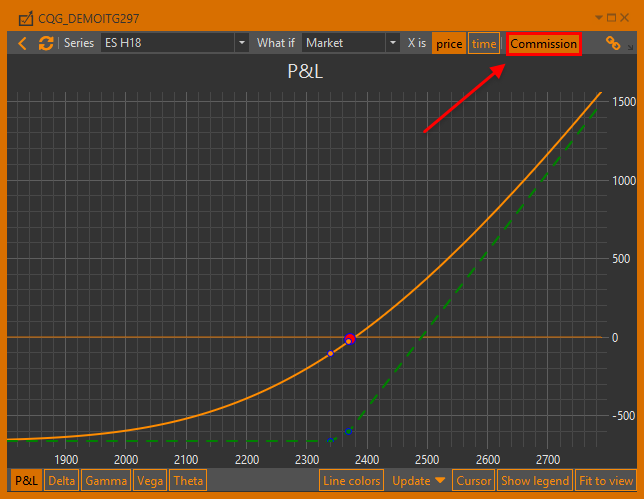 We have added the ability to display the P&L chart so that it takes the commission into account. When you click on the Commission button, the chart is shifted down to the size of the commission. Instructions on how to set a commission are provided in the documentation. the best ask price is lower than the theoretical price. We’ve also added the number of days until the expiration of options series to the Option Desk tab name. We’ve added the instrument code to the Historical chart tab name. In the new version, you can add contracts to the market maker in an additional way: drag a position or strategy from the Position manager and drop it into the the market maker setting form. Thus, a position contract will be created in the form. Incorrect work of the delta hedger in discrete mode. The price of the underlying asset was not updated on the graph IV. Incorrect functioning of Ctrl + Tab hotkeys. Volatility values were not imported into Option Workshop when the CSV file was opened in MS Excel.